Showing results for tags 'abandonware'. 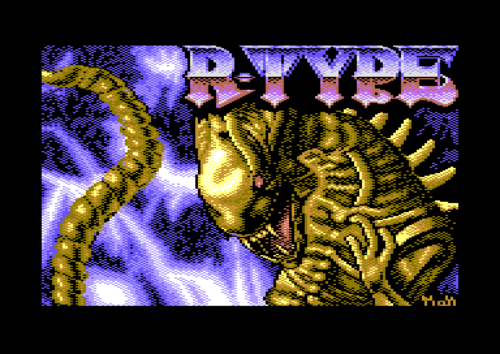 R-Type +9DMHI Original Game by iREM · C64 Port by Rainbow Arts · Cracked/Packed/Fixed by Hokuto Force This is the Commodore 64 port of iREM's classic shoot'em up R-Type. This release has been cracked, packed and fixed by Hokuto Force. Details: Buggy sprite multiplexer has been fixed. Re-enabled the 2nd player mode which was disabled in the original release. Nine trainers added. Documentation added. Hi-Score saver added. IDE Compatibility added. 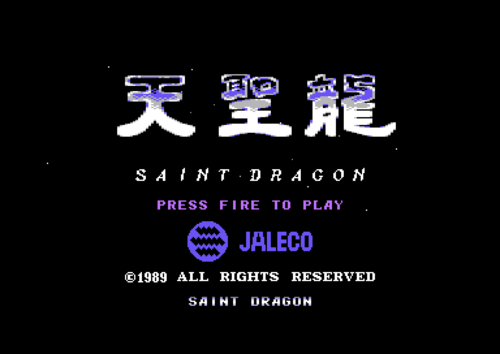 SAINT DRAGON Game by Jaleco · Port by The Sales Curve · EasyFlash conversion by Master This is a Commodore 64 port of Jaleco's Saint Dragon. The C64 port was created by The Sales Curve in 1989 and converted to an EasyFlash cartridge image by Master in 2018. The game runs fine in both PAL and NTSC video formats. 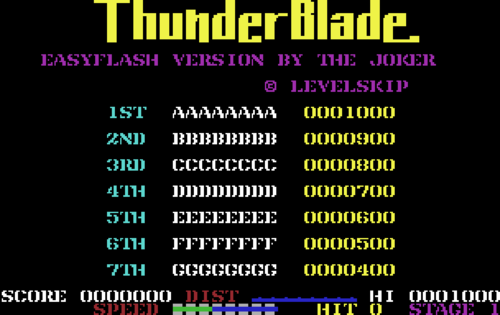 Thunder Blade (サンダーブレード Sandāburēdo) is an arcade, flight-based, third-person rail shooter originally released for video arcades in 1987. In the game, players control a helicopter to destroy enemy vehicles. The game was released as standard stand-up arcade cabinet that introduced the use of force feedback, as the joystick vibrates during gameplay. A sit-down unit was also released, replacing the force feedback with a seat that moves in tandem with the joystick. Versions of the game were later released for the Sega Master System, Amiga, Amstrad CPC, Atari ST, Commodore 64, DOS, MSX, TurboGrafx-16, Sharp X68000 and ZX Spectrum. The Nintendo 3DS remake was released as a 3D Classic in Japan on August 20, 2014, in North America and Europe on May 14, 2015, and in Australia on July 2, 2015. The game's plot and setting resembles the 1983 film and 1984 TV series of Blue Thunder. The player controls a helicopter using guns and missiles to destroy enemy tanks, helicopters, etc., to save his home country. Levels are in both a top-down or third-person perspective view. The boss levels are in the top-down view. 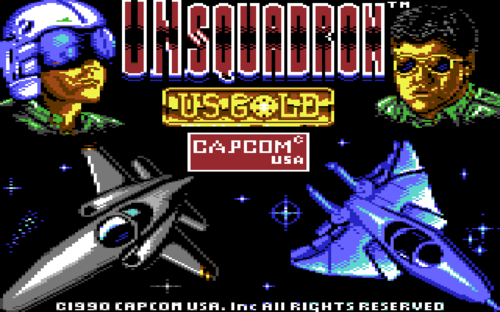 U.N. Squadron is a 1989 side-scrolling shooting game released by Capcom for the CPS arcade hardware and for the Super Nintendo Entertainment System. The game was released in Japan as Area 88 (Japanese: エリア88 Hepburn: Eria Hachi-Jū-Hachi) and is based on the manga series of the same name, featuring the same main characters. Here, their mission is to stop a terrorist group known as Project 4. It was followed by a spiritual successor Carrier Air Wing. The game is a typical side scrolling shooter, going against the trend of other Capcom shooters, such as 1942, and 1943: The Battle of Midway, which are vertically scrolling shooters. However, like other Capcom shooters, the player has an energy bar that is consumed over the course of a single life as the player sustains damage. 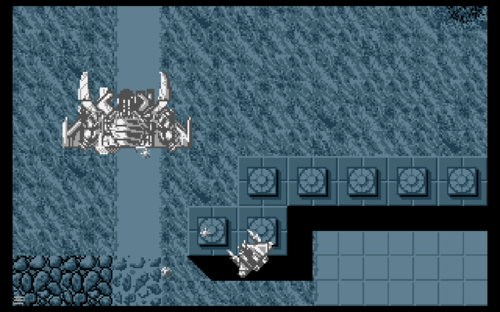 This trait is highly uncommon among other comparable arcade-style shooters which normally use a system of reserve lives, where one of which is lost upon a single enemy hit. Before entering a level, the player can purchase special weapons or added defenses in the shop. The player earns money to buy weapons by destroying enemy planes and vehicles during levels and, when the level is finished, any unused weapons are converted back into money. The player can choose between three mercenary pilots: Shin Kazama, Mickey Simon, and Greg Gates. Each pilot flies a specific plane and has slightly different capabilities. The game was converted to the Super Nintendo Entertainment System and Super Famicom in 1991. 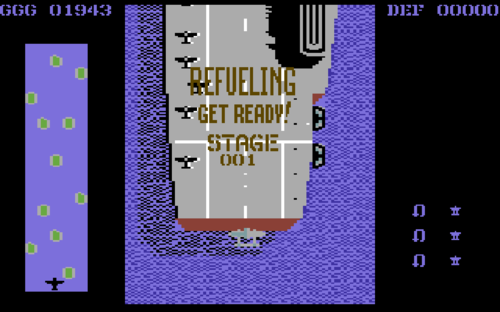 Unlike in the arcade version, each pilot can use a range of planes. All pilots start out with $3000 and the basic F8 Crusader, and can buy other aircraft and weapons as they progress. 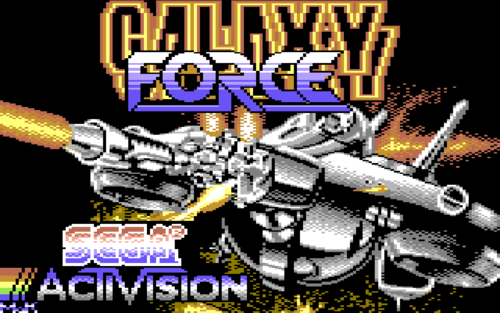 Galaxy Force II is a sprite scaling rail-shooter.. in this case, done as well as the Commodore 64 can pull off. This version is packed as an EasyFlash cartridge image. 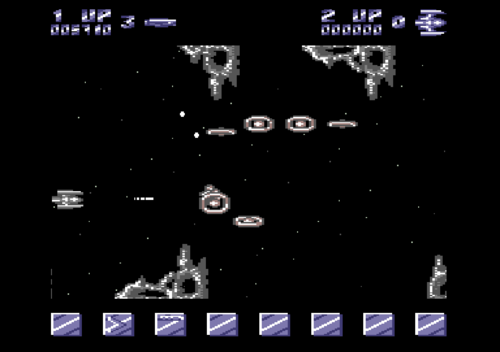 Retrograde is horizontal side-scrolling shooter for the Commodore 64 published by Thalamus... Similar to Side Arms. This version has been packed and patched into an EasyFlash cartridge format by The Master. 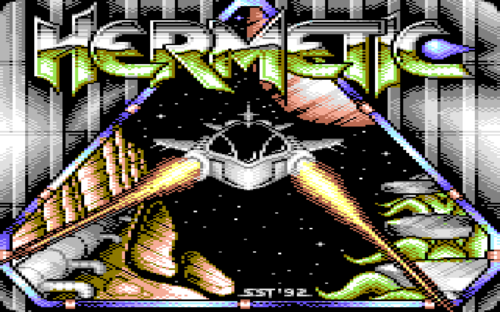 Hermetic is a horizontal side scrolling shoot'em up for the Commodore 64. 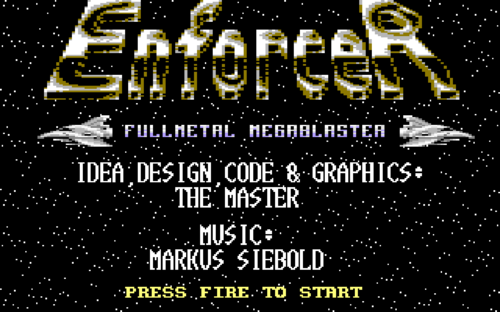 Enforcer is a side-scrolling shooter for the Commodore 64. This release has been packed into an EasyFlash cartridge image by Master. 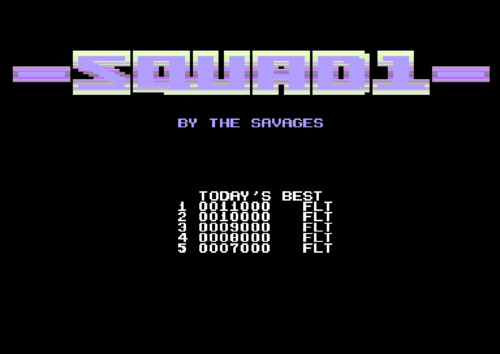 Squad 1 is side-scrolling shooter similar to Gradius for the Commodore 64. This release was originally done by Fairlight in 1988 but has been further fixed, NTSC Patched and +6 trained by Laxity. 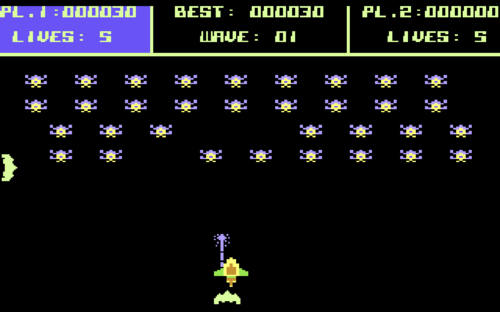 Space Conquest is a single screen vertical shooter for the Commodore 64 with aspects of Space Invaders and Galaxian. 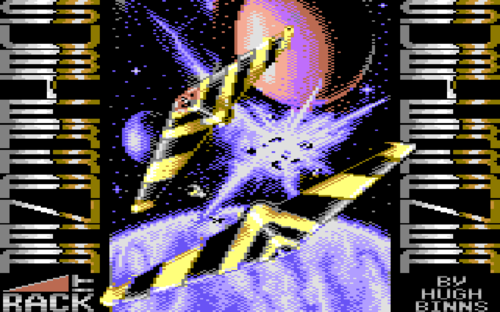 SWIV is a 2D vertically scrolling Shoot 'em up game originally released in 1991 for the Commodore Amiga, Atari ST, Commodore 64, ZX Spectrum and Amstrad CPC home computer formats. It was converted to the Game Boy Color in 2001. 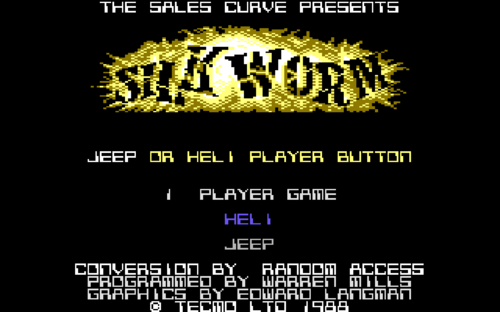 The game was considered a spiritual successor to Tecmo arcade game Silkworm, which The Sales Curve had previously converted to home computer formats in 1989. 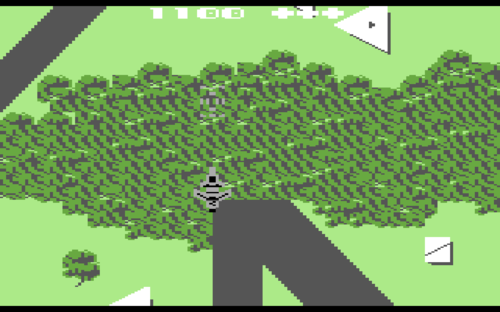 The game's heritage is evident from the game design whereby one player pilots a helicopter, and the other an armoured Jeep. SWIV is not an official sequel, as noted by ex-Sales Curve producer Dan Marchant: "SWIV wasn't really a sequel to Silkworm, but it was certainly inspired by it and several other shoot-'em-ups that we had played and loved." 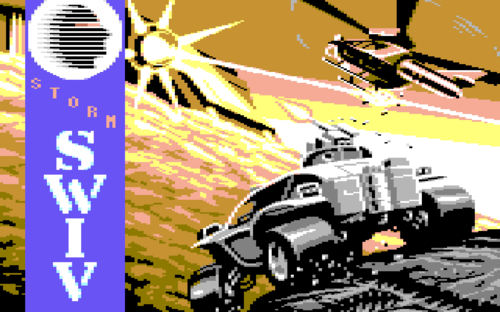 In the game's own manual (for the Amiga, at least), however, it was explained that "SWIV" was both an acronym for "Special Weapons Interdiction Vehicle" and also short for "Silkworm IV" (even though there was not a Silkworm II or III). 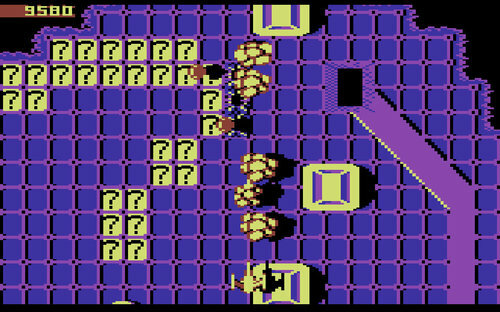 Subterranea is a side-scrolling shooter for the Commodore 64. 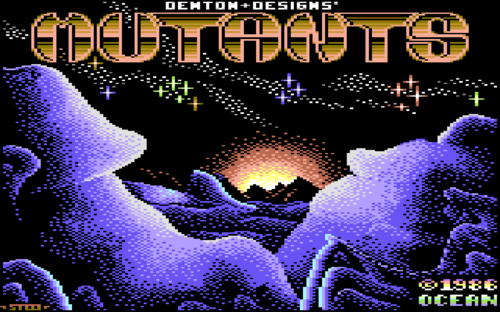 Mutants is an arena / maze shooting game for the Commodore 64. 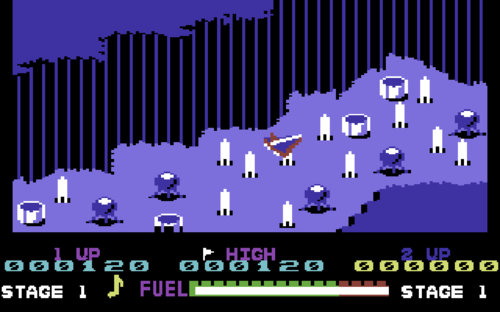 Fire Track is a video game published in 1987 on Commodore 64 by Electric Dreams Software. It's an action game, set in a sci-fi / futuristic, shooter and shmup themes. Here is the video game “Flak: The Ultimate Flight Experience”! Released in 1984 on Commodore 64, it's still available and playable with some tinkering. 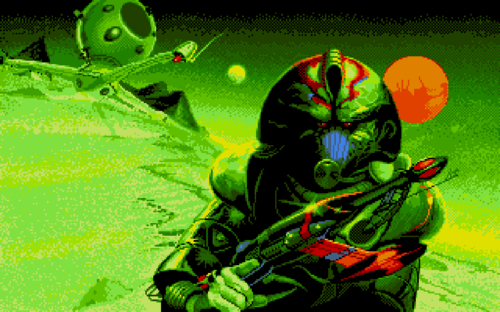 It's an action game, set in a sci-fi / futuristic, shooter and shmup themes and it was released on Atari 8-bit as well. At first glance, Dragon Spirit looks just like any other vertical shooters, except that you ride a dragon instead of a spaceship. Once you spend some time with the game, however, you will find many neat differences that set it apart from most shooters. Your goal is to go through 9 stages to rescue your sister and her maids from an evil demon called Zawel. When you start the game, you can breath only a puny single-shot fire blast, but you will slowly grow to become a three-headed flame breathing monster. Yes, you can grow heads in this game - just one of the neat power-ups you can find. Other power-ups include firepower increase, speed boost, and calling up two "ghost" dragons to help your cause. Along with power-ups, there are also "power-downs" - bad items that you must avoid, lest they drain your power, etc. The difficulty system in Dragon Spirit is one of the most innovative ones you'll come across in a shooter. Once you beat the demon Zawel, you can go on to play the game in the "Blue Dragon mode" which is the normal mode. If you lose this one, you play the "Gold Dragon mode" which is an easier, shorter mode. This makes the game fun to players of all skill levels. Yet another innovative feature of Dragon Spirit is when you rescue the maids at the end of each stage. If you have "fulfilled" certain things, the maid will be visible and can help you. Last but not least, Dragon Spirit is very intuitive and easy to play. The graphics is no match for the crisp graphics of the original arcade game, but it is more than adequate - and almost on par with the official Amiga conversion. In 1987, Electronic Arts, Inc. publishes Delta Patrol on Commodore 64. This action game is now abandonware and is set in an arcade, sci-fi / futuristic, shooter, shmup and space flight. 1986, the year '43 - One Year After was released on Commodore 64. Made by Greve Graphics and published by American Action AB, this action game is available for free on this page. Here is the video game “A.L.C.O.N.”! Released in 1987 on Commodore 64, it's still available and playable with some tinkering. 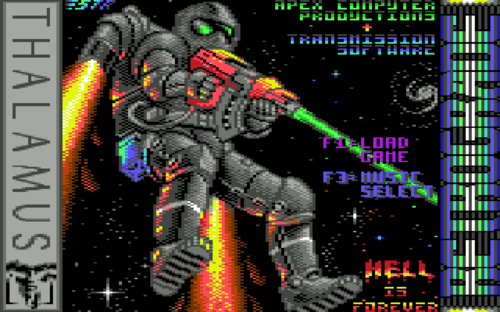 It's an action game, set in an arcade, sci-fi / futuristic, shooter and shmup themes and it was released on Amstrad CPC and Atari ST as well. If you haven't played 3-D Skramble or want to try this action video game, download it now for free! 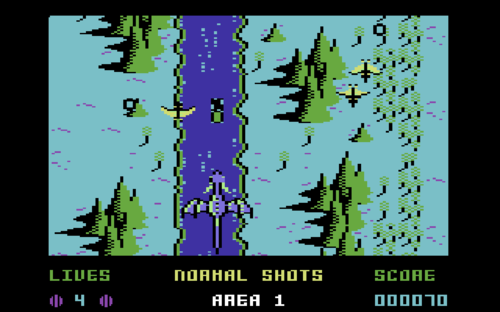 Published in 1984 by LiveWire Software UK, 3-D Skramble was an above-average shooter title in its time. 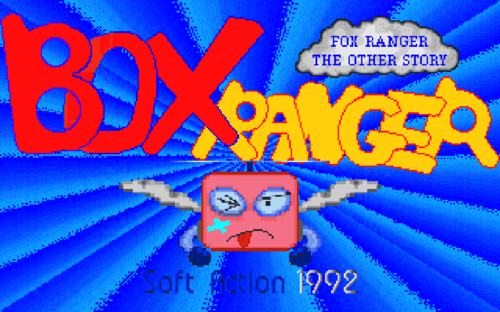 Here is the video game “Box Ranger”! Released in 1992 on DOS, it's still available and playable with some tinkering. It's an action game, set in an arcade, shooter and shmup themes. 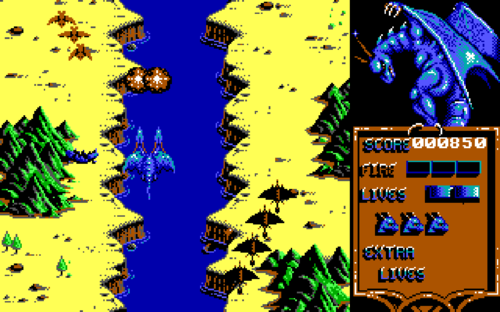 1991, the year Battlestorm was released on DOS, as well as Amiga. Made by Titus France SA and published by Titus Software Corporation, this action game is available for free on this page.